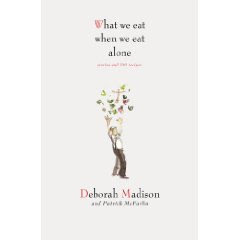 The January book for The Kitchen Reader group is What We Eat When We Eat Alone by Deborah Madison and Patrick McFarlin. As the title suggests, this book examines the question of what people eat when they eat alone, and why. The book is broken down into chapters which deal with different aspects of people eating alone, and explores issues such as differences between what men and women eat when dining alone, the reason for people's choices, their favourite dishes, and recipes for some of the dishes mentioned. Unfortunately, I didn't really get into this book. I started reading it with great expectations, as the title would suggest it was a book written for someone like me, but ultimately, I found it as interesting as reading someone else's grocery list. I also didn't relate to the recipes - most of them were things that I would not dream of making. Perhaps this is because even though I often eat alone, I am more than happy to make myself a proper meal. Sure, I will often divide that meal into portions, freeze it and proceed to eat it for the next week, but I never feel the need to skimp on cooking for myself or to eat something gross and lacking in nutrition, in bed with my cat while I read a book just because I eat alone. OK, perhaps I am taking bits from the most extreme scenarios in this book and stringing them together, but I really didn't relate to what most of the people interviewed for this book ate alone. Maybe it's because I have never had to deal with the demands of regularly cooking for others, so I don't appreciate what a release it can be for people when they finally get a chance to eat alone. Whatever the reason, this book did not hit any chords with me. To see what the other Kitchen Readers thought about this book, visit The Kitchen Reader blogroll. Despite the heat on the Australia Day holiday (around 33 degrees Celsius), I couldn't help myself and I baked. On the weekend, I had found fresh figs that were reasonably priced, and I knew exactly what to do with them. Here are the figs pre-transformation - aren't they lovely? Unfortunately, during baking, some of my lovely fig "flowers" closed up, pushed together by the frangipane - oh well. And the verdict? Delightful! Delicious! The pie shell dough was difficult to work with, and I ended up having to roll it between two sheets of baking paper to stop it sticking and tearing, but the icing sugar in the recipe gives the pie shell a lovely flavour. The frangipane is smooth, creamy and delicious, and the fresh figs drizzled with sugar syrup and sprinkled with lemon zest, chopped almonds and thyme, then gently baked, are out of this world! I loved this pie. Unfortunately, my work colleagues may not have loved this pie as much, as by mid-afternoon, there was still one piece left. (Perhaps they were scared off by the whole fig sitting plumply in the middle of this slice?) However, I rejoiced, wrapping it up and having that piece for morning tea the next day. This is a great special occasion dessert (or, if you are like me, any occasion). The flavours in the pie are magnificent - exotic, smooth and creamy. The pie also presents very elegantly. Love it! On Tuesday, 26 January, it was a public holiday in Australia to celebrate Australia Day, which marks the date when the first white settlers arrived in Australia. True to form, Australia Day was fine and very hot, and many people went to the beaches and had barbecues with family and friends. Despite a last minute invitation to a barbecue lunch, I stayed at home doing all kinds of things, including baking (of course!). However, to do something a little different to mark the occasion of Australia Day, I bought a steak to make a steak sarnie. I made the chutney on the weekend after spotting it on Johanna's site, Green Gourmet Giraffe. You can find the recipe for the chutney here. Australians traditionally love beetroot on their burgers, and a burger "with the lot" always has one or two slices of ruby red beetroot on it. I am a beetroot fan myself, and couldn't resist this beetroot and orange recipe when I saw it on Johanna's site. The chutney is easy to make, and only requires that you be around for an hour or so to cook the chutney and stir it occasionally. I only made a half batch, as I would otherwise be eating chutney for the rest of the year, but it is a welcome addition to my fridge. This chutney can be used as dip (as Johanna did) with flatbreads, crackers and the like, or is a terrific accompaniment to beef or fish. However you serve it, I am sure that you'll enjoy it if you are a beetroot lover. It's time to announce the winner of the Womens Weekly Little Pies and Cakes giveaway. Taking out my comments and those who didn't want to enter, the winning number was comment no. 6 of 14. Drumroll please ... the winner is Lazy Cook of The Lazy Cook. Congratulations! I'll be in touch soon to obtain your mailing details. Thanks to everyone who reads this blog - I am delighted that so many of you take the time to read my posts, and I have enjoyed getting to know many of you better through your blog and comments. The challenge comprised first up of making your own graham crackers for the nanaimo bar crust. The do not sell graham crackers in Australia, so I was very glad to finally have a recipe for making them myself (because lots of American recipes call for them). We could make the graham crackers either gluten free or with gluten. I really wanted to try the gluten-free version, but found the flours impossible to source easily, so I made the crackers with ordinary plain flour. The crackers came off without a hitch for me - which is a relief! Finally, you top the bars with a mixture of melted chocolate and butter. This part didn't work so well for me, probably because the chocolate was too warm for the buttercream. If I made these again, I'd probably chill the bars after the buttercream step to make it easier to spread the chocolate topping. I found the nanaimo bars to be very sweet and rich - a little too much so for my liking. However, they disappeared at work - always a good sign. Thanks to Lauren for hosting us this month and choosing nanaimo bars - it is something I've always wanted to try because it is a Canadian speciality not sold here. To check out how the other daring Bakers went, check out the Daring Bakers blogroll. This week's Tuesday with Dorie challenge is hosted by Steph of Obsessed with Baking, who selected Dorie's Cocoa-Nana Bread for us to try. As the name suggests, coca-nana bread is chocolate and banana flavoured cake. Dorie suggests that it might be suitable as a breakfast treat, but I don't really agree with that observation - this bread is a pure tea-time treat. I thought this bread was delicious - the banana flavour was not at all overwhelming, and in fact, I didn't even really notice it, with chocolate being the dominant flavour. The recipe must also be fairly forgiving, because I made a boo-boo while making it, and it all still turned out OK in the wash. You see, I was making this while talking on the phone, and when it said to measure out 3/4 of a cup of milk, I managed to measure out 1 3/4 cups of milk! Even though my brain told me that it looked like an awful lot of milk, I managed to pour in 1 1/2 cups of it before I awoke from my slumber, and thought "holy crap!" Not really knowing what to do next, I just added another cup of flour to hopefully counteract the moisture, left out the chocolate chunks ('cause who is gonna waste chocolate on a potential failure? ), and hoped for the best. And lo and behold, I baked it, and it worked! I didn't have a tin as large as Dorie required, so I made one loaf and 6 muffins (I ate one prior to the photo!). To see what everyone else thought of this week's pick, visit the TWD blogroll. If you want the recipe, buy the book, or visit Steph's site. This month, Mr P of DeliciousDeliciousDelicious is celebrating that Australian icon, the lamington, spurred on by the uninspiring lamingtons that Mr P sampled while on a trip to the fair city of Melbourne. Mr P has laid down the gauntlet and challenged us to re-invent the lamington. The highly sought after prize for the best lamington re-invention is Welsh; namely, a dragon shaped cookie cutter. Mr P himself has come up with some fabulous variations on the lamington, which you can check out on his blog; in fact, since 16 January, he has been posting a different lamington recipe every day. Cherry Ripe lovers, check out his Cherry Ripe lamingtons from Day One! After spotting this competition on IMBB, I knew I had to participate - after all, the lamington is an Aussie icon! My entry in the great Re-inventing the Lamington competition is inspired by Australia's floral emblem - the golden wattle. Fluffy, golden wattle flowers are found in clusters amid silvery green leaves on wattle trees, which you can view in all their glory here. The wattle has inspired poetry, prose and art, having more than a just a symbolic influence on our national psyche. I can remember many delightful Sunday drives in the country as a child, with beautiful wattle trees in full bloom lining the sides of the road. After all, raspberry lamingtons (coated with raspberry jelly) are common in Australia, so why not lamingtons coated with lemon jelly? From a visual perspective, my original patty-cake idea was more visually accurate, while the larger rounds gave fluffier lamingtons of a more regular size. And voila - wattle lamingtons! Beat the eggs in an electric stand mixer until thick and fluffy. Beat in the sugar in 2-3 increments. Remove the bowl from the mixer, and carefully fold the sifted flours and wattle seed into the beaten egg mixture. Spoon the mixture into the prepared cake tin (if making patty cakes, only spoon in about 1-2 teaspoons of mixture per hole), and bake in the pre-heated oven until cooked through (~15 minutes for the patty cakes; ~30 minutes for the large cake). Turn the cooked cakes out onto wire racks lined with baking paper to cool. While the cakes are cooling, prepare the jelly coating by making up the lemon jelly as stated on the packet, and refrigerating for 45 minutes or until the jelly has formed a slurry (ie not still watery, but not yet properly set). Cut out 3cm rounds of cooled cake (if using the large cake). Sandwich pairs of patty cakes or cake rounds together with lemon curd (I used Stephanie Alexander's recipe to make mine). Dip the sandwiched cakes into the lemon jelly slurry, so that the outside of the cakes is coated thoroughly, then toss the cakes in dessicated coconut that has been tinted yellow. (To tint the coconut, place 2 cups of it into a plastic freezer bag, add 3-4 drops of liquid yellow food colouring, and rub the coconut around in the bag until a yellow shade is achieved.) Chill the lamingtons to set the jelly coating, and remove from the fridge around 15 minutes prior to serving. Thanks to Mr P for hosting this fun event! Can't wait to see all the other lamington variations - I have enjoyed those that I have seen so far very much. If you have a yen to reinvent the lamington, you have until 12:00 GMT on Australia Day, 26 January to get your entry in. 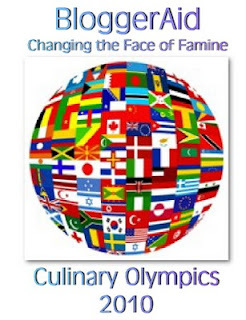 BloggerAid - Changing the Face of Famine is hosting a Culinary Olympics to coincide with the Winter Olympics in Canada. The aim of the event is to promote food as sport (LOL) and BACFF's mission - namely to actively promote the alleviation of World Hunger. I am an Australian member of BACFF, so I have chosen a typical Australian (and particularly Queensland) dish for my entry - namely, Frangipani Pie. It is apparently otherwise known as Pineapple Cream Pie. Whatever moniker you know it by, Frangipani Pie is delicious - it consists of a sweet pie shell filled with alternating layers of coconut custard and pineapple custard, and is topped with fluffy meringue. And take it from me - it is devine!!!! The smooth, creamy coconut custard is offset by the tangy pineapple custard, and the meringue gives the whole dish a wonderful, marshmallowy mouth-feel. What's not to like? The yellow and white colours of the pie reflect those of the frangipani (plumeria) flower, after which the pie is named. Frangipani flowers are a common sight in Queensland, particularly at beachside resorts. Of course, frangipani flowers also come in other colours, mainly varying hues of pink and white, but the yellow and white ones have my heart. The recipe that almost everyone uses to make Frangipani Pie is this one from the Golden Circle website. Golden Circle was a Queensland-based and Australian-owned cannery for all kinds of fruit, and is synonymous with pineapple in Australia, but, like many Australian iconic brands, it has now succumbed to globalisation and is owned by Heinz. You can eat it warm or chilled - I like it both ways. BACFF has requested that I remind you of their wonderful BloggerAid Cookbook, which you can buy online here. The profits from sale of the book go to the United Nations World Food Program. Coincidentally, I have another pie recipe in the book - so if you like pie, check it out! I am also sending this frangipani pie to The Blonde Duck from A Duck In Her Pond, who is hosting Glorious Pie Celebration Saturday over at The Pond. You can send your pie recipes to her by 3pm Texas time today. For Duckie's ode to pecan pie and a great pic of her Dad pouring "gravy" on his pecan pie, click here. Duckie is probably the world's number one pie fan. Frangipani pie - flying the flag for Oz!!! For a change of pace, I am going to post about a couple of savoury dishes today. Both of them are curries - despite hating curry or anything highly spiced in my youth, I now adore them, although I don't like my curry so hot that it makes your eyes water. The first curry, appearing at the top of this post, is a Thai red chicken curry. It is a reader's recipe from page 20 of the January/February 2010 edition of Australian Good Food magazine, from Jane Kelly of Mildura. It cheats in that it uses commercial curry paste rather than requiring you to bang away at a long list of spices in a mortar and pestle, but that suits me - curry in a hurry is always welcome! The red curry paste gives this curry a nice kick, without making your eyes water. The green of the peas and beans in this recipe contrasts satisfyingly with the red curry, making it a visual as well as a gastronomic treat. Heat the oil in a frypan or wok, then add the carrot and onion and cook until the onion is soft. Add the chicken, beans and curry paste to the pan and cook until the chicken is cooked through, stirring as necessary. Add the coconut milk, peas and sweet chilli sauce to the pan, stir well, then reduce the heat and simmer for ~5 minutes until all ingredients are heated through. Serve the curry on a bed of rice, topped with coriander garnish. My next dish is Jane Kennedy's beef vindaloo from Fabulous Food Minus the Boombah. This curry tastes fantastic! It has the just right amount of flavour and kick, and is a satisfying meal. Unlike Jane, I served it with standard rice, because I was not in the mood to make Jane's cauliflower "rice" (as Jane believes that rice is a serious "boombah" food for her, she makes faux rice from cauliflower). This book contains Jane's own recipes that she designed to feed her family and herself great, tasty food without piling on all the calories. Australian audiences would know Jane from her television work in Frontline, a spoof of current affairs shows, and her work behind the scenes with Working Dog Productions. Accordingly to this article, Jane has had her beef vindaloo recipe laboratory analysed, and it has only 60% of the calories of a standard takeaway beef vindaloo. As it is the dish which she is most proud of, I won't provide the recipe here - if you are interested in the recipe, you will have to check out her book. Have you ever seen a recipe and built up high hopes around it, and literally itched to make it, then when you finally do, it falls short of your expectations? This is exactly what happened to me when I made Jocelyn Hancock's Brandied Custard and Raisin Tart, from p22 of Brisbane News (December 2-8, 2009). I am not blaming Jocelyn or the recipe - it's just that (a) I found this tart too eggy for my liking (and I am a fan of egg custard); and (b) I used a smaller pie tin than recommended, which resulted in the wrong ratio of fruit to custard in the finished tart, making it a little "meh" in my view. I substituted the brandied raisins for fruit mince, which could have worked well if the custard component of the tart had turned out. Put the raisins and 160ml of brandy in a small bowl and allow the fruit to soak overnight. Next day, preheat your oven to 165 degrees Celsius. Put the zest, yolks, eggs, sugar and cream into a large bowl and mix well. Stir through the remaining 20ml brandy. Cover the base of the pie shell with the raisin mixture, then pour the custard mixture on top. Sprinkle some nutmeg on top of the custard, and place the tart in the oven to bake for 40-50 minutes or until set. Remove the tart from the oven and allow it to cool. Chill before serving. I have just realised that this is my 500th post - I can hardly believe it, but it is true. Just like this blog, this book is a little bit savoury and a little bit sweet - hopefully something for everyone. If you'd like to win this book, just leave a comment on this post. I will then use a random number generator to generate a number, and if the number of your comment matches that number, you win the book! It doesn't matter where you are from - for this celebration, I will mail anywhere in the world that has a postal service (although I can't guarantee that it will actually get there - the mail can be mysterious). If you don't have a blog, you will need to leave your email address with your comment so that I have some way of contacting you if you win. Entries close at 6am Australian Eastern Standard Time on 27 January 2010, and the winner will be announced on this blog by midnight Australian Eastern Standard Time on the same date. Good luck! Every now and again, a Dorie recipe makes me go weak at the knees - literally. Unfortunately, this normally happens when the recipe is very, very naughty from a nutritional perspective. And so it was this week. Our TWD host, Lillian of Confectioner's Realm, chose Dorie's Chocolate Oatmeal Almost-Candy Bars. Let me tell you folks, these bars are not almost candy bars - they ARE candy bars! They consist of a buttery, oaty base, onto which is slathered a rich, fudgy filling comprised of condensed milk and chocolate and studded with dried fruit (Dorie chose raisins, I chose cranberries), then topped with more of the oaty dough. The resulting taste is out of this world - or to quote the Hoodoo Gurus, Like Wow, Wipeout! For the recipe, go to Lillian's website. And to drool over these bars some more, visit some other TWD members via the TWD blogroll. Today was Viv's birthday. Viv works in our finance section at work, so this is a sneak preview - she won't see this cake until tomorrow. The cake is Aprikosenkuchen, or Apricot Cake. According to About.com, it is a popular cake in Germany that many Germans learn to make by heart. The recipe for this cake can be found here. Viv is Chinese, not German, but I still think she'd like this cake. I made it in a sweet heart-shaped pan, inspired by Sally Seltmann's film clip for Harmony to My Heartbeat - her heart-shaped layer cake is so cute that I really wanted to make a heart-shaped cake myself. I may have left my cake in the oven for a teensy bit too much time, because the apricots started to brown; however, as I was using a very different size and shape of cake tin to that called for in the recipe, I wanted to be sure that the cake was cooked through before taking it out of the oven. I can't comment on the taste of this cake yet, because I am saving it for Viv tomorrow - but I will try and update this post then with the feedback. Postscript - this cake was good - it was certainly not a sweet cake, and is on the more substantial side, but it would be perfect for someone who is not really a sweet tooth. Our TWD host this week is Teanna of Spork or Foon? She has chosen the intriguingly named Mrs Vogel's Scherben as our Dorie recipe for this week. 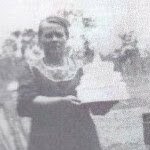 Mrs Vogel was a real person who is the source of this recipe, and "scherben" (love that word!) is the German word for fragments - because this is what these cookies are - fragments of fried dough, dusted with cinnamon sugar and icing sugar. The biscuits without the sugar dusting are very plain - you could almost dip them in salsa and it would be fine. Although I loved the name of these biscuits, I didn't really like them that much - I found them to be very plain, even with the sugar. Mrs Vogel's son adores them, so it's just a personal thing. If you'd like to try these, Teanna will have the recipe. To see what the other TWD bakers thought, go to the TWD blogroll. My Christmas baking has meant that I have quite a few leftover ingredients that I need to use up - not turkey and ham, but sweet ingredients. From my Rocky Road, I had a huge bag of marshmallows which I had been guilty of eating from every time I walked past it, and from the White Christmas, I have an enormous box of Rice Krispies. This combination of leftovers was begging to be made into Deb of Smitten Kitten's Salted Brown Butter Rice Krispie Treats - you can find the recipe and Deb's commentary here. My rice krispie treats are pink because my marshmallows were pink and white - perfect for a girl's birthday party! The mixture is very thick and reasonably hard to pat down, so I recommend taking Deb's tip of using a piece of oiled baking paper to push the mixture into the pan. The resulting treats are delish - very light and sweet and crunchy. Kids would love these for their lunch boxes (if you don't mind the fact that they aren't really healthy). I still have heaps of Rice Krispies left, despite using 6 cups of them to make these treats! I am searching for recipes that use both the rice krispies and milk powder, and am open to suggestion. I mentioned previously that my good friends Steve and Craig gave me a copy of Loreto Cooks, compiled by the Catholic girls school in Toorak, Victoria. At the time, I posted about the Rocky Road recipe (which was delicious!). However, around the same time, I also made mango chicken, a recipe submitted by Amanda Quirk. There are two recipes for mango chicken in the book, but the one that I chose did not include cream - given that it was Christmas and I was already eating way too many boombah* foods, I needed to cut down wherever possible. This mango chicken was delicious. I spoiled it somewhat by adding too much salt afterwards - do not do this! The recipe is good as is, and if you feel that you need to add salt, go easy on it instead of tipping in half a jar, like me. I love the vibrant colour of this dish - it looks like sunshine. Heat enough oil for cooking in a large frypan (I actually just sprayed the base of the pan with spray oil, and that was heaps). Add the onion, curry powder and cumin, and cook until the onions are soft. Add the tomatoes, chutney and honey, and cook for 5 minutes. Add the chicken and cook for a further 15 minutes or until the chicken is cooked through. *Boombah is a word used by Jane Kennedy in her new cookbook Fabulous Food, Minus the Boombah, and means "food that makes your [backside] fat". This week is the second anniversary of Tuesdays with Dorie - congratulations to our founder, Laurie, for starting the group and keeping it going. To celebrate, Laurie gives us the choice of making one (or both) of two recipes - one for Tarte Tatin, and one for a Cocoa-Buttermilk Birthday Cake. I have been a member of TWD since October 2008, so I wasn't there at the beginning, but Dorie's Baking - From My Home to Yours is already the most used cookbook that I own. I am over cake at the moment, and have never made Tarte Tatin before, so that is what I made. For the base, I used home made puff pastry, left over from a Daring Bakers project, and I used Granny Smith apples. I always wondered what the fuss was about making Tarte Tatin - why is it regarded as difficult? I found out when I flipped out my tart - all of my carefully laid concentric circles were laid to naught, as ALL of the fruit tipped off the tart when I flipped it over out of the oven. (For the uninitiated, you make tarte tatin with the fruit on the bottom, then flip it over once it is cooked so that the fruit is on top.) So if the apple pattern on top of my tart looks a little haphazard - it is. That said, the tarte tatin tasted delicious - as it would with all of that sugar and butter. I have just returned from family holidays with a groaning stomach, so having now tasted a small slice of this tart, the rest is going to work so that other people can help me with it. Happy New Year to all TWD members everywhere, and to all my readers!